Preeti Shenoy had this post on her blog a while ago which captured my attention and I have been wanting to do this for a while now. Finally found the time to take a picture and upload. Like Preeti says, fridges do have character. Every time am at a friend’s place, I am fascinated by what the have on their fridge or not. I look at the things stuck on it and wonder what story they are trying to tell. My fridge is a mute witness to my life and tells a story by itself. Mostly there are magnets that are reminiscent of the places I have visited. Each time I look at those magnets, I remember something lovely from the time I spent there. Like Napa valley with my cousins wine tasting or Hersheys with my FIL and mom or Seattle and endless chat sessions with my cousin. Then there are innocuous looking magnets that were gifts from K to me. The one that says “Happiness is home brewed.” Nothing could be truer of our lives. The two pastel hangings were a gift from my friend Arch for my birthday in 2001. I remember being touched, thrilled and surprised that she remembered to not only wish me but send me a gift as well. Those are one of the most treasured gifts I have. There are the two witty magnets acquired from visits to Amish County 30 miles west of where I live. Each have provided laughs whenever someone visits home and reads them for the first time. To me they are a reminder not to take my weight issues or fights seriously. On a rather sober note, the one about not going to bed angry always reminds me never to carry over disagreements to the next day. It’s a rule K and I live by and is quite something we are proud about. Previous Nice person with a beautiful smile! “Lord if you wont make me skinny, make my friends fat” LOL! You don’t know the number of times I have stated this quote to others as “Laksh has this hilarious refrigerator quote” – Thanks for the reminder yet again, Laksh. Hadn’t been to Ps’ blogs since Typing Away turned slow, hi Ps, I noticed from Suma’s blog that you have a book of your own now, congrats… I never stuck anything on my fridge until my daughter came along, now it is usually pics of hers and her peers taken usually during Xmas hols…and a few of her art work that brightens my day. Awww…thanks laksh….did you get my card though this year? Finally a tag that I can take up to break my slumber as I do have quite a number of magnets on my fridge. @Manchus: Please do and let me know so I can check it out. I missed the “weight issue” magnet. But thanks to UL for telling what it is. That’s definitely hilarious. I don’t why I don’t have anything on my fridge. Occassionally I put some clippings/tips from magazines think it’s going to be helpful but I don’t even take a look at it. But after visiting your place the Lakshmi magnet you gave me is on the fridge now, but other than that nothing. @Madhu: Never really noticed your fridge. Given you are so much into baking, I am not surprised that you have tips and such. @Selvi: Thank you! Lucky you!! Laksh, like Selvi points out, the neatness and order of the magnets appealed to me. Mine is somewhat similar to yours, but definitely a lot more cluttered 🙂 we have magnets from all the places we had been too, couple of witty magnets, Atul’s drawings, some visiting cards and important phone nos. @Suman: Than you. 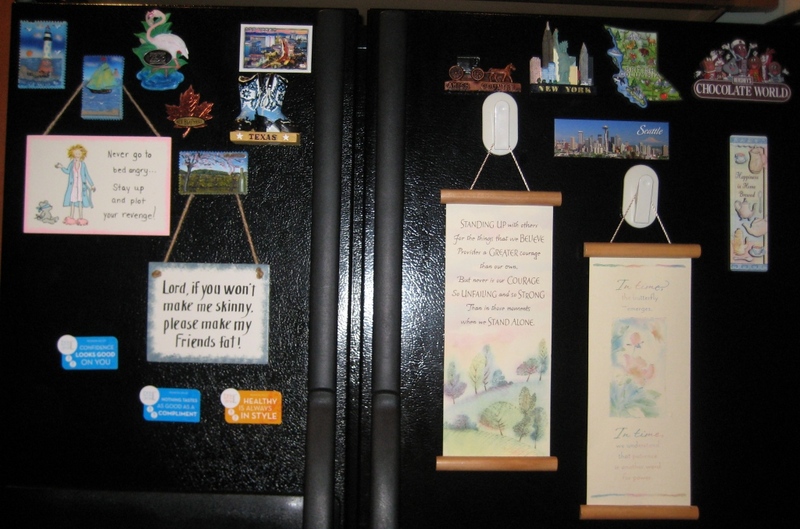 Would love to see your post on your fridge if you do decide to do it. I would like to take this up. :–) Errr… after I finish my alphabet post. Kool! And of course, funny too! @Shalu: I remember how it used to be living at home with parents. Soon, you will have your fridge and can put up all the stuff you want on it. quite nice fridge;outside and inside(i’m sure there are yummy stuff inside). @Shy: Am sure it must be heartwarming to see your kids express themselves on the fridge.